One of London's best kept secrets could shortly be up for sale. Mail Rail - the little known electric rail system running for 6.5 miles under the centre of the capital - is to close at the end of this month after 75 years. Cash-strapped owners, the Royal Mail, said the automated mail delivery system costs too much to run. But post bosses revealed they were in talks "with a number of organisations" about possible alternative uses. Royal Mail said the system would be "mothballed" until a partner can be found to help run it. But it declined to name the organisations that have allegedly shown an interest - or to what use Rail Mail could be put in the future. Wine to the capital's vintners. The Royal Mail has not ruled out selling Mail Rail, raising the prospect of rail enthusiasts - or even a private individual - taking it over. Any change of use would require an act of parliament, however. So the prospect of Mail Rail becoming the plaything of a wealthy commuter - or a fun alternative to the real underground is remote. Andrew Pelling, chairman of the London Assembly's public services committee, has urged the Royal Mail to keep the unique system running. "I just want the Royal Mail to be open-minded, rather than just saying it is ours, but we are not going to do anything with it," he told BBC News Online. He said there was a "great danger" that the Royal Mail would "throw away a useful asset" to make short-term savings. "We are all shareholders in the Royal Mail. It is a public sector organisation. "We would like to see it maximise the value of the asset rather than going straight for a mothball," he added. The system was thought to be losing about £250m a year, said Mr Pelling, but closing it was not a cost-free option, as it could not just be abandoned. Mr Pelling said the London Development Agency was trying to help the Royal Mail find a new use for the system. Mothballing Mail Rail will lead to 80 extra van journeys per week, potentially putting the postal service at odds with its commitment to cut carbon dioxide emissions. But the Royal Mail insisted it would make little difference to overall pollution levels. It would also have little impact on traffic congestion, the service claimed. Even after the introduction of Congestion Charging it would still be cheaper to transport mail by road, it argued. But the organisation has come under fire from the London Assembly, which says it has not done enough to find an alternative use. "The mothballing of Mail Rail will mean a team of 76 experienced members of staff will be broken up; if it is brought back into use a whole new team will have to be recruited and trained," it said in a report. Mail Rail originally served eight stations, which later went up to nine and there were even plans to extend the network. But it has been gradually run down over the years, and only three stations are currently in use. The narrow gauge line carries an average of four million letters and parcels a day. In its heyday, the service carried 12 million items daily. We asked what Mail Rail be used for in the future. Here are some of your ideas. Surely this is an ideal opportunity to do the crossrail project on the cheap. How about re-boring the tunnel and using it as the long planned cross-London rail link? A little extension to link it onto the Paddington express and dig down a bit to make more room for the larger trains. The King Edward building would be a stop in the city and an extension to Stratford would link it to the Euro tunnel. Not sure why you dub it "One of London's best kept secrets"? I recall it being on Blue Peter back in the early 70's and that John Noakes became a passenger on it! If it can, it should be fitted out as a tourist attraction. I can't believe the short sightedness that businesses and government in this country have. Looks like the Royal Mail are following the mentality of the previous government of shutting down or selling off for short term profit anything that produces a long term benefit to this country. Surely we'd might as well privatise anything else we have left for a small boost in financial benefit for those concerned. Then give the rest of the country to immigrants that we pay to live here, through our steadily increasing stealth taxes. Bah, I am seriously looking to work in another country, this place is a waste of time. It would be cheaper than drilling from scratch, runs along the right route of Paddington to Liverpool Street and even the extra stations are well sited. Rathbone Place is yards from Tottenham Court Road tube, for example, and a connecting foot tunnel would be far less costly than an entirely new system. Much of the money has already been identified, too. How about using Mail Rail for collecting unwanted food (eg from supermarkets, restaurants, staff canteens) to offer to the homeless in conjunction with charities which distribute food to the homeless as part of its service (e.g. IC soup, West London Initiative On Single Homeless, Hare Krishna ISKON distribution projects). A report by www.crisis.org.uk estimates that £350m worth of food ends in landfills/incinerators each year, enough to feed 270,000 homeless people. Perhaps we can explore ways of helping the needy, rather than focusing mainly on how to assist commercial enterprises with their activities. Use it to deliver the mail, stupid! Get the polluting vans off the roads. If it makes economic sense to also use it for other industries (shops, jewellers, etc), then use it for that as well - there isn't any reason it can't be shared. Just another example of government/business short-sightedness. If we're going to meet the Kyoto environment targets than we need to expand things like the Mail Rail not shut it down. Typical. It should be used as a secure parcel/package delivery service, to reduce the increasing number of courier bikes, cars and vans on the Capital's roads. By creating network 'hubs', the system could expand and a spin-off would be reducing pollution over London. Keep it intact and in use please. We need less road traffic not more : even if the financial "wizards" don't like it I do! Why isn't England more proud of it's assets and try to manage and maintain them like very other European country? I started off as a Geordie boiler maker at Vicker's Armstrong's Works, Scotswood Road, in 1938, and ended up as a senior examining RAF Captin in 1974. I was the OC Flying RAF, Gibraltar in 1967. It would be typically British to be so un-proud, short sighted and possibly naive, about something which is at best a unique and potentially indispensable installation and at worst a wonderful curiosity and historically important system, and also typical for it to be closed down or (as usual with inventive British creations) completely destroyed. It seems to me highly likely that such a system would in the future, at some point, be extremely useful for something! Why would tourists want to spend time down a railway line? A good use would be to use it to lock away all of the politicians and civil servants who contributed to turning a reliable useful service into an unreliable and unprofitable one. As a tourist, being in London every 2 years or so, I certainly would love to have the opportunity to ride the Mail Train. Shut it down - it runs under our house and is too noisy! Being under London and functioning, it would be a real waste to see it closed down for good. I feel that this system is unique and a prime example of British engineering and culture, why doesn't your government step in and re-develop it to join more London sorting offices? It could be made into one of the best postal systems in the world, an inspiration to all, something to be really proud of whilst reducing pollution and congestion for your busy city. Why isn't England more proud of it's assets and try to manage and maintain them like very other European country? I feel more English people should be more proud of what their country has done and achieved rather than throwing it away all the time! Again here we are with the small mindset of the till-obsessed which knows the price of everything and the value of nothing. As Ken The Mayor has succeeded with the congestion charge perhaps the post office should hand it over to the London Assembly so they can find a use for it which will benefit the citizens of the capital and not put wads of cash into some highly paid Director¿s severance package when he screws-up. The original line (shown on this map) http://homepage.ntlworld.com/c.karslake/mailrail/html/po_map.html was planned to be extended (see suggested extensions at http://homepage.ntlworld.com/c.karslake/mailrail/images/extension.gif). Why is not more money invested into ideas like this to make it more practical? Airlines could set up check in desks for Heathrow in the City, passengers could check in the City with their bags transferred to Paddington on Mail Rail then onto the Heathrow Express while the passengers make their own way there free of bags. I believe that this underground tunnel has a great potential of playing a role in London Underground; as there is an existing tunnel, if research and planning is done properly then is would be able to ease tube congestion in central London. This must be the most cost effective way of improving congestion in the London underground as well as helping to tackle congestion charge. If my understanding is correct then most of the post offices on the line are not in use, thus; a passage down to the train, a tunnel, already connected electricity, what an opportunity to improve London in more than one way! Maybe our tube transportation system has a chance to be compared with the system in Paris. a) The route of the "mailrail" system is almost identical to that of the proposed underground section of CrossRail - it goes from Paddington in the west to Whitechapel in the east via New Oxford Street and Liverpool Street. b) When the Northern Line was created from the two different lines (many decades ago), the City and South London Railway and the Northern Electric Railway, the tunnels of the former were widened to the size of the latter in less than a year; London Underground has also increased tunnel sizes before to increase train speeds. So therefore, I was wondering why CrossRail cannot simply purchase the MailRail system, widen the tunnels (many fewer, if any, planning problems here!) and create CrossRail from this? If the route is already tunnelled, there are going to be many fewer problems than starting from scratch. Look how quickly Thameslink got going when they found that old tunnel! Could the system be used as an alternative to the central line? It could also be used for Crossrail maybe for the Olympics! Here is a pilot tunnel and a set of surface access points for a new cross-town tube line. Use the existing infrastructure, and dig two grown-up tunnels alongside - faster and cheaper than CrossRail. The new "Olympic Line"? It should be used as a private toy train for the Post Office bosses. (To go along with their rip-off salaries). Having seen Rail Mail on a visit I feel there would be huge interest in the facility being opened as part of a visitor attraction. Perhaps it's about time to have a museum celebrating our world class postal service? Did I hear someone say "Pub crawl"? If it really can whiz along at 40mph, then it might have potential as a premium commuter line. For heavens sake, can this country stop living on memories. If something that was built for a special purpose and it is not longer needed get rid of it. The only people to mourn will be train buffs! its a historic, conveyance tool, a good use of the tunnel could be created as needed or put data storage computers. 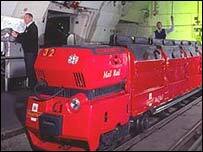 I was taken down to see the Mail Rail as a kid, by a family friend, in the 70's. But putting aside sentimental feelings, it seems perverse that such an obvious asset to London should not be put to good use. Being able to move stuff across the city at 35-40mph must be worth something! Why not use it as a new tourist attraction as part of a newly designed museum on the history of the Royal Mail (and perhaps communication in general)? After all, the history of the Royal Mail is more exciting and diverse than a mere philatelist's geek-fest. If you add to the mix the odd smattering of highwaymen, the Great Train Robbery, Postman Pat (! ), the design process of creating new postage stamps (a design and print your own personalized stamp section?) and the future of communication just to name a few exhibits then there is something for all the family. The train ride would be the icing on the cake (since everyone loves a train ride). I would go and I am sure my son, when a little older would get a thrill out of the train. I think it should be sold to Dr Evil so he can transport his henchmen to and from his underground lair. Price? $100bn! I realize that this is unglamorous, but since the system is narrow-gauge and completely automated, perhaps it could be used somehow in the garbage or recycling systems of the city. With the four foot height limit, it is not suitable for commuter traffic, but it could perhaps be used to ferry parties of young children on school runs. If they are packed in with standing room only, they would be unable to misbehave, and they can get a foretaste of life as a grown-up in London. Also we might get rid of some of those enormous people carriers that anxious Mums seem to favour. Turn it into a nuclear/chemical/biological shelter for the population of London - I think we're going to need it! So while Crossrail is being reconsidered because of the cost, we have this alternative running under London. Assuming passengers are willing to crouch down, is this not an alternative? I'm sure Pizza Hut could find a use for it. I'm a bit lost here, surely this must give Royal Mail a real competitive advantage over current and future rivals? Could they not open the service up to there courier arm, Parcel Force? "Mail rail is a shadow of its former self - rising costs have forced it to the end of the line"